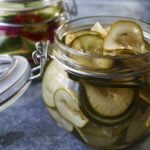 Spring and summer is the perfect time to make these easy Refrigerator Pickles! They are crunchy and sweet, easy to make and the perfect topping for a burger. They also make a great snack. Now that you know how easy they are to make you'll be enjoying them all summer long! In a medium pan over medium heat combine the vinegar, water, salt and sugar. Stir until the sugar and salt are completely dissolved. Remove from heat and stir in the celery salt (if using). Set aside and cool completely. Pack them in a large plastic bowl or glass jar. Pour over the marinade and cover tightly. ** For variations, use rice wine vinegar & black sesame seeds or poppy seeds. You can also add red onion, carrots or jalapeños. Great use of cucumbers in summer as these will keep for several months in the refrigerator.